I recently had the honor of giving the first ever webinar for Food Tank. At least that’s what I’m told happened. I just spoke into my computer and hoped that people were listening. And based on the array of questions, at least a few folks were! Q: Seems odd that one of the drivers of waste is the low cost of food and overproduction, but yet there are a large number of food insecure (not saying the numbers are wrong, just seems odd). Seems like it should be easy to solve (to the naive like myself anyway). A: It does seem odd. And it is odd! But that’s the dysfunctional food system we now have. You’re hitting on the fundamental incongruity of food waste. That we regularly discard a potential solution to hunger. It does seem easy to solve this imbalance because it would be. Or at least it would be if we really committed to tackling hunger. How big is the impact of biofuel/ethanol? And does that factor into the waste count as well? In your opinion what area of the foodservice industry would warrant detailed research on foodwaste. All areas of foodservice warrant a closer look! The industry-led Food Waste Reduction Alliance is doing just that, but I’d love to see more independent studies and data on exactly where our waste is coming from. In general, all-you-can-eat and self-service are two major problem areas, though. When the two combine, it’s the worst case scenario, as it leads to great food waste, overeating and the inability to donate the remaining food (for health code reasons). Everyone is concerned about feeding 9 billion people in 2050 – how do you feel about this? I’m concerned! If we continue with our present rate of wasting—about 1/3 of global food supply isn’t consumed—we’ll be in big trouble by then. All the more reason to tackle our current food inefficiencies—and the sooner the better! Thanks for the talk Jonathan! You mention that there needs to be an ethical concern for answering questions of why people waste food and what our attitude towards food should be. Could you perhaps explain this in more detail? 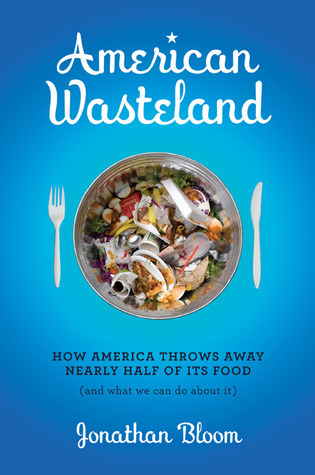 For example, on what grounds should Americans be concerned with food waste? What is the moral obligation, in your opinion? To be frank, it’s immoral to have a glut of both food and hunger. To be wasting 40% of our food while 15% of US households are food insecure is unconscionable and unjust. If we were to redistribute just 2% of what we’re currently wasting, we’d have enough to end food insecurity in America. That’s shouldn’t be too difficult. But it is very difficult if we don’t set our minds to ending hunger—if we don’t have the social and political will to do so. So which of these options do you think would have the biggest impact if we could choose to implement only one nation wide tomorrow? How do we change the cultural and behavioural issues that prevent avoidable food being redistributed or repurposed (particularly by the commercial sector)- i.e. retaining a higher ‘value’, and not just devalued as ‘waste’? Well, having that legislative aid of making it illegal to discard food would certainly help prompt behavio(u)r change. It will be interesting to see the impact of the upcoming state landfill bans on food waste in Massachusetts, Vermont, Connecticut and Rhode Island. An awareness campaign drawing attention to the issue of food waste and the scale of hunger wouldn’t hurt, either. Both would provide more incentive to get past those unfounded fears and inertia that leads to so much unnecessary waste. Are there any governmental groups that are pushing towards combating food waste? Possibly giving grants or funding for programs? The USDA has issued the Food Recovery Challenge and has signaled an intent to do more on the topic. The same goes for the EPA. But—surprise, surprise—there’s no funding involved for programs or grants. Hopefully this changes as the triple benefit (ethical, environmental and economic) of reducing food waste becomes evident to the decision makers. Are there any of these reclamation/food waste sourcing programs in Canada? Second Harvest is a major organization doing food reclamation. Vancouver has its share of non-profits rescuing food, and FoodShare Toronto does great work. Also, you should check out Just Eat It, a fine documentary made by some delightful, dumpster diving Canadians. What is the name of the federal law you mentioned that protects people/companies from liability for sharing their excess food? It’s called the Bill Emerson Good Samaritan Food Donation Act. Someone at the Food Recovery Project at the University of Arkansas School of Law wrote a great legal analysis of the law. Are there any programs in place that help place food waste with livestock producers? Right now it seems like it is up to a farmer or livestock nutritionist to actively seek out food waste as a livestock feed. There are no programs that I know of to help farmers find feed source. And it’s discouraged in a way, given the requirement that farmers have to heat the scraps to very high temperatures to kill any potential pathogen. And in Britain, feeding swill to hogs is prohibited, which has prompted this neat campaign called The Pig Idea. So it is up to the farmer to source feed from food scraps, but I’d say the potential savings and environmental benefits should provide plenty of motivation to do so! Additionally, farmers can buy feed from companies like Florida-based Organic Matters, which transforms food scraps into animal feed. What about foraging wild food and teaching people to eat the foods nature already provides? That’s what I’m about. What about it?? Just kidding… Yes, that’s a nice approach to eating, and one that can be really healthy, too. It’s neat to see some of the gleaning organizations that harvest nature’s abundance. Falling Fruit hosts all kinds of amazing maps for foraging urban edibles. Iskashitaa Refugee Networkfood fo integrates refugees into American life by harnessing the citrus (and other fruit) bounty around Tucson. And Food Forward in LA and Portland Fruit Tree Project work their magic in larger cities. …I have to go to a meeting, but would love to hear what Jonathan thinks about using BSFL as waste conversion machines to reduce waste by converting it into new useable proteins for feed and food and biofuels. If we could convert a fraction of what’s in our landfill, the economic and environmental rewards would be astronomical! From what I’ve read, Black Soldier Fly Larvae are great at transforming animal waste or food scraps into a benign product, and then they are then a source of protein for chickens. Given voracious appetite for any kind of waste, they are quite useful. It’s like a turbocharged version of worm composting. Those two processes do yield different end products, so it really depends what you’re hoping for and what needs you have. But if you’re just looking to get rid of organic waste and don’t care what you get back, BSFL are the way to go! This entry was posted in Composting, Energy, Environment, General and tagged Food Tank, food waste, Jonathan Bloom, Wasted Food, webinar. Bookmark the permalink. Both comments and trackbacks are currently closed.